Clearly, transparency is in. Various e-tailers and brands are flinging open the doors of their factories and offering consumers an inside look at how their products are made—and, in some cases, priced. In an industry propelled by its alluring mystique and plagued with murky supply chains, it’s a radical move but one that the following businesses are hoping pays off in increased trust and brand loyalty. 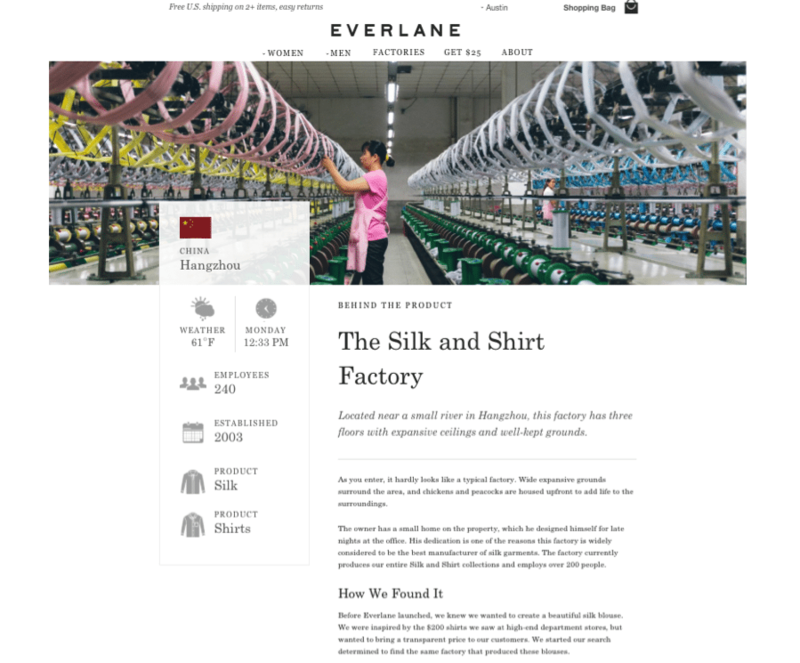 Since its inception in 2011, Everlane has put transparency front and center in its marketing strategy. For every product sold, consumers can read about (and see pictures of) the history of the factory it was made in and how that establishment was chosen, the specific materials used and the exact production process. 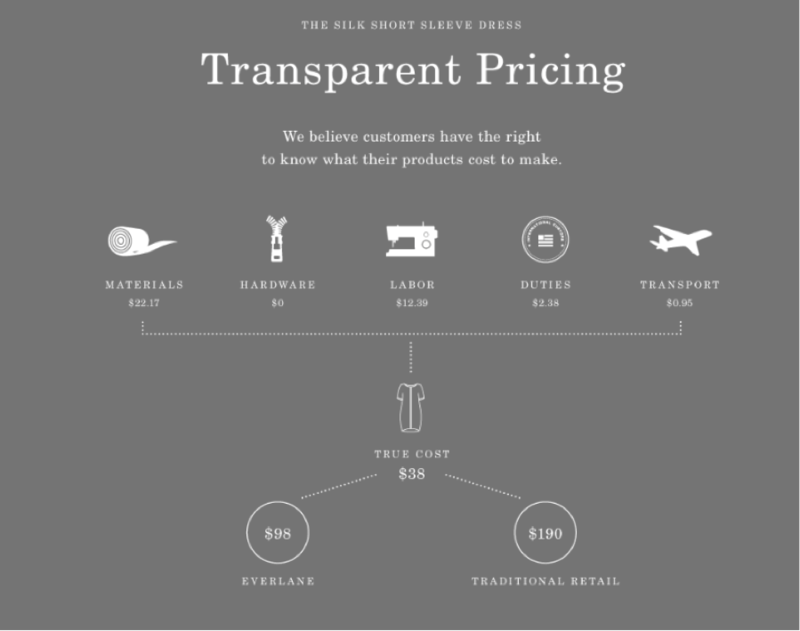 Additionally, Everlane breaks down the cost structure of every item, disclosing the price of materials, hardware, labor, duties and transport to justify their markup versus that of a traditional retailer. Most recently, the company has launched the event series “Transparent City,” to be held in various cities around the country this year. The initial five-day affair in Los Angeles, which took place in March and sold out within days, involved a local factory tour, an educational farm-to-fork dinner at Sqirl with chef Jessica Koslow, and a pointed panel discussion with likeminded brands Reformation and The Hundreds on, you guessed it, transparency. The next stop has yet to be announced, but brand enthusiasts are being encouraged to cast their votes. What’s the point of such an endeavor? Well, there are two big ones: It fosters a more personal connection between consumers and an online-only brand. 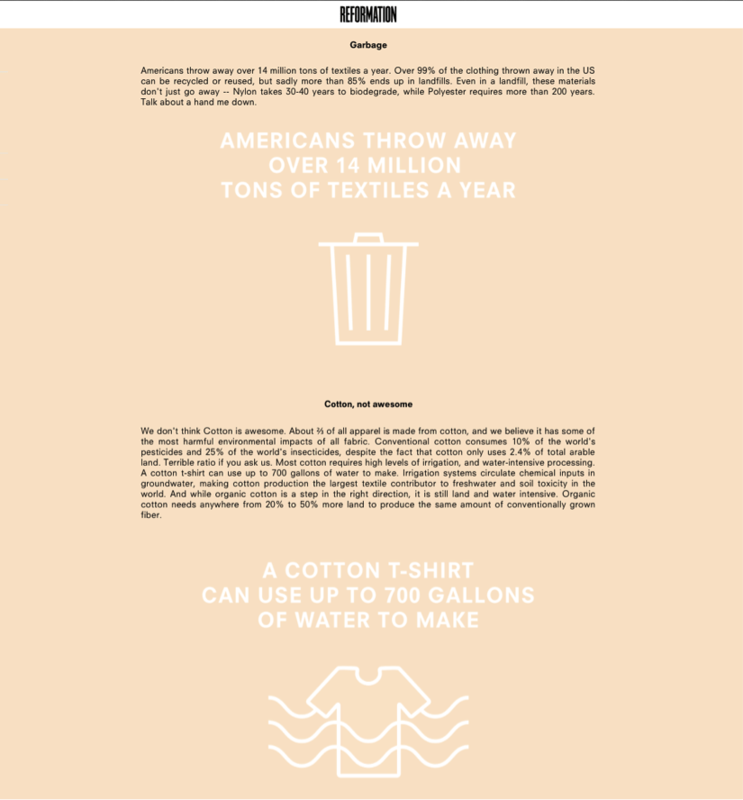 Secondly, it drives home a key tenet of Everlane’s brand story: that the same responsibility you feel to recycle and eat organic should also apply to the way you dress yourself. Brands that are open with buyers about how their products are made usually have something to brag about, and more often than not it’s locally sourced materials and environmentally-friendly practices. The LA–based clothing label Reformation employs both. 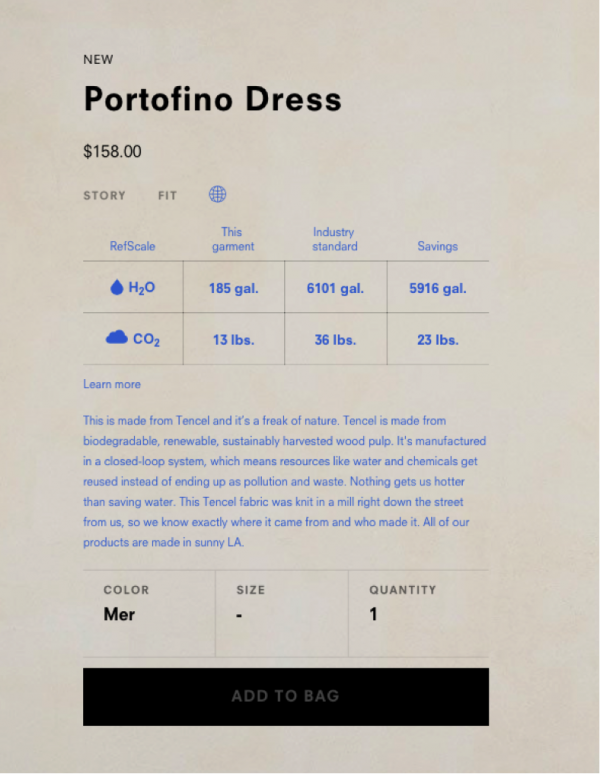 For a thorough lesson on the dangers of fast fashion or how you should care for your clothes the eco way, just visit the brand’s website, where you can also take a virtual factory tour. Even if you bypass all of that, upon visiting the product page you’ll still be confronted with each garment’s environmental impact. (See screenshot below.) Needless to say, the company isn’t shy about its stance, which includes a devotion to vintage and sustainable fabrics, green building practices, and recycled hangers and packaging. Reformation wants to market to an informed customer, thus it takes up the mantle of education. The goal, of course, is for the people who buy these clothes to feel good about doing so—and to spread the word to others. Through its own storytelling, Reformation provides the talking points for such a conversation. It’s an approach with the potential to transform lukewarm buyers with responsibility on the brain into passionate brand advocates. 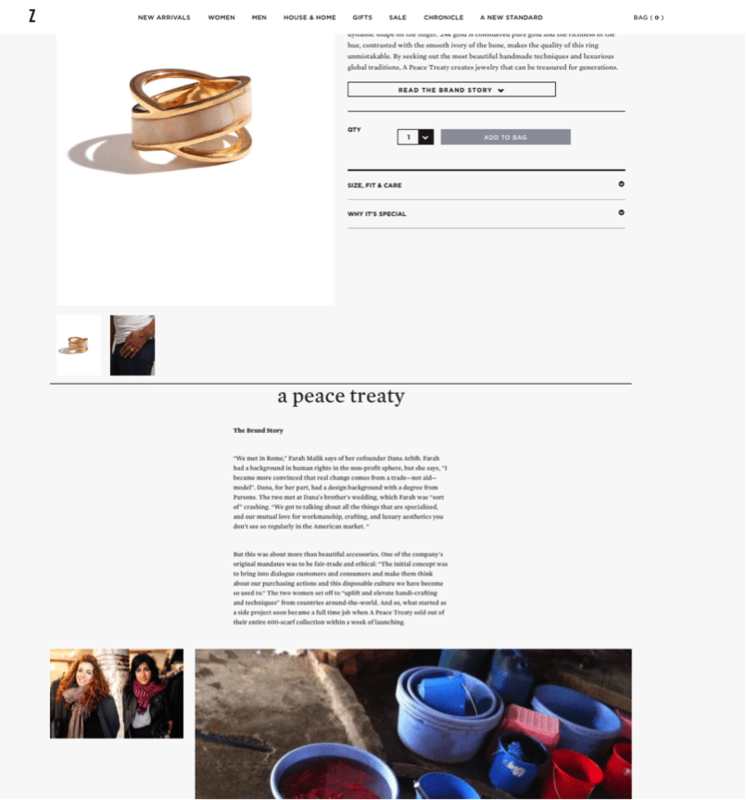 Described by Forbes as “the Whole Foods of Fashion,” Zady is a curated e-commerce destination that prides itself on partnering only with makers who are willing to be held accountable for their materials and production processes. There’s a photo-driven story behind every brand on the site, which features clothing and accessories for men and women, as well as home goods. By weaving together content and commerce, the company aims to reinforce its mission of sustainability and encourage consumers to buy from brands they can trust. Zady’s storytelling—not unlike Everlane’s “Transparent City” series—serves to create an emotional bond that is often lacking in online shopping. After learning more about a particular product and the way it’s made or the people behind it, customers view their purchases differently. Their own narrative changes in a way that positions them as being part of something bigger or giving back in some way. Bombarded with more options and by more distractions than ever, today’s consumers want to feel a connection to the things they buy, which certainly includes the clothing and accessories they don every day. Transparency, and starting a dialogue around it, could be the ticket to capitalizing on that desire. Have you come across fashion brands with a message of transparency? If so, what are they, and how has that message affected the way you view the brand? Share your thoughts with us in the comments.